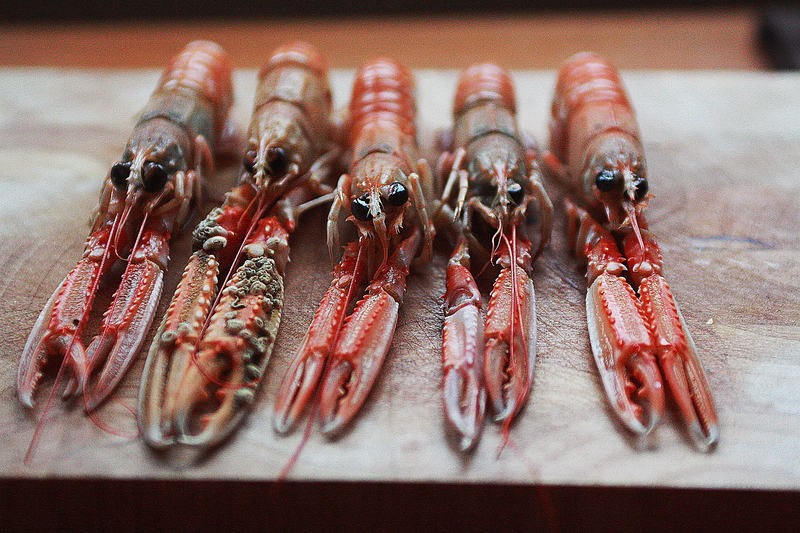 I love to use the best local ingredients that I can, and as I’m spending a bit of time away from my home in Devon, up in Bonny Scotland, I saw these alien like Scottish Langoustines and snapped them up. 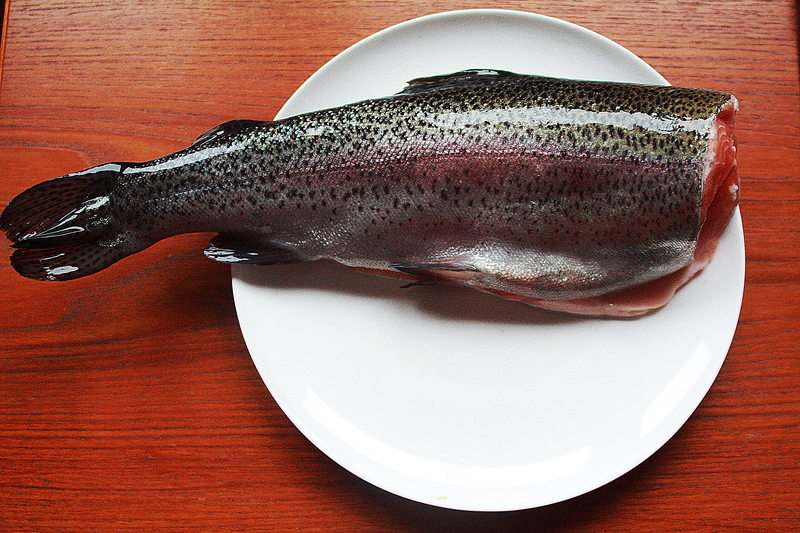 I also have managed to catch myself a lovely Rainbow Trout yesterday evening, a beautiful 3 lb slab of silver and rainbow colours and as fresh as it gets. I made up a Thai style broth, with a litre of light fish stock, which I brought up to a simmer with a stick of lemongrass, a crushed clove of garlic, a little piece of galangal or ginger, a few slices of red chilli, and half a lime squeezed and thrown into the saucepan. I pan fried steaks cut from the trout until brown both sides in a little wok oil, and halfway through popped the langoustines in the pan to cook. Meanwhile I cooked some green noodles with a few branches of choy sum greens until soft and drained them. I popped these in a lovely earthenware soup bowl that I’ve treated myself to. 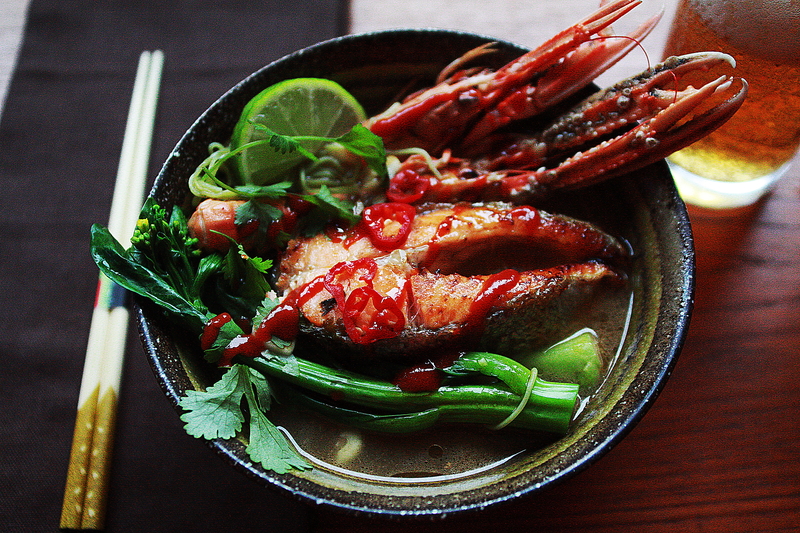 Topped with a couple of langoustines, a trout steak, and added a few drops of fish sauce, some sesame oil, soy sauce, coriander and a good squeeze of Sriracha chilli sauce. I enjoyed this immensely with an ice cold bottle of Kirin lager. 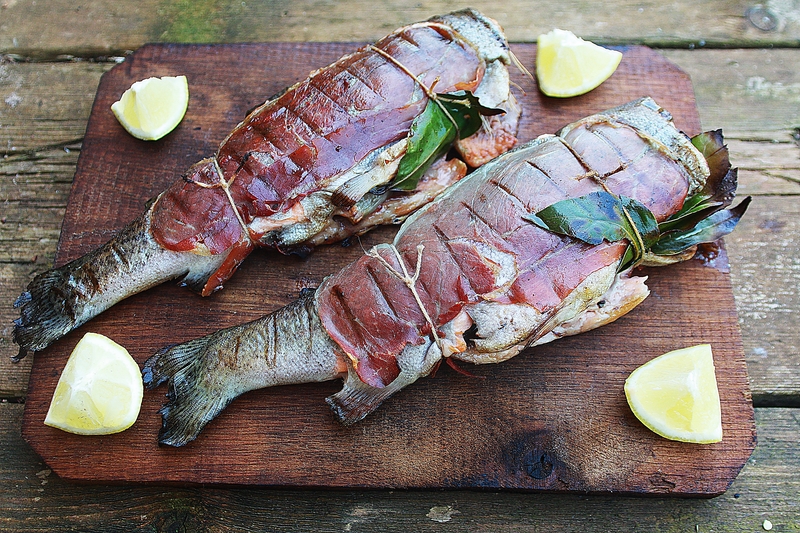 Do you ever have the problem, that when you have cooked your fish to perfection on the BBQ, you find that it has stuck to the grill bars, then try this technique and recipe Barbecue prosciutto trout parcels and serve some really great fish at your BBQ this summer. I went fly fishing in the week to the wonderful Exe Valley Trout Fishery on the edge of Exmoor, and was fortunate enough to catch 4 rainbow trout, which I had an eye on hot smoking. So once home, I filleted them out, and dry cured them with crushed juniper berries, coarse sea salt and brown sugar. The fillets were left to cure in the fridge overnight, and the liquid drained off the next day, this is a wonderful process as it alters the texture of the fish completely, and all it needs is a quick rinse and drying off and it was ready to pop in the smoker. 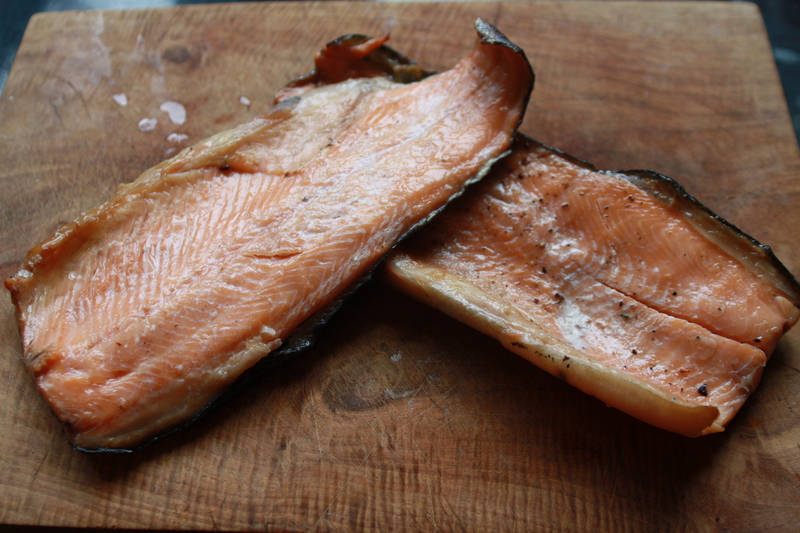 I used my cold smoke generator to cold smoke the fish for 8 hours using beech dust to produce a slightly sweet smoke. After this initial smoking I popped some charcoals in the smoker, and hot smoked the fillets for 20 minutes until they were cooked through. The fillets were well smoked with the beech smoke giving the fish a delicious subtle sweet smokey taste, and the juniper berries coming through with a slight peppery gin flavour. 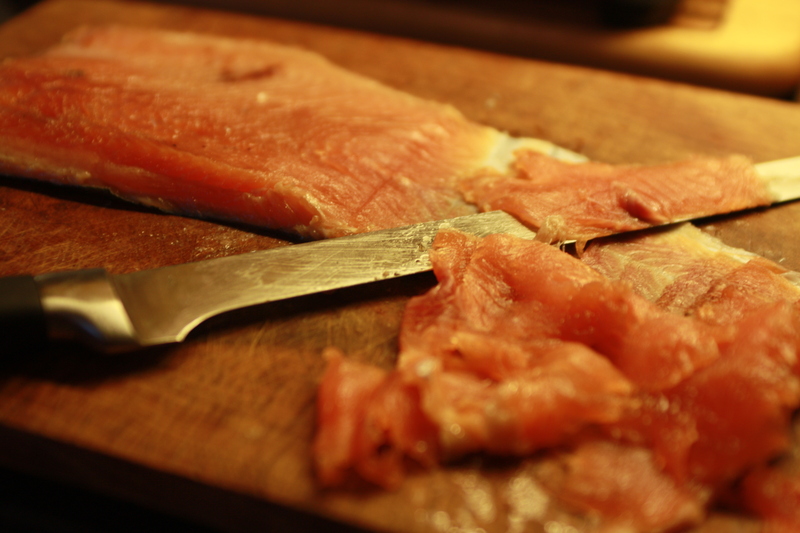 See the following post for how I made best use of these lovely smoked trout.